Originally built to allow pedestrians to easily reach the 'new' Castor Bay Estate at the northern end of Milford beach, the Milford foot bridge has long been a focus of debate for local residents. Ref: Photographer unknown. 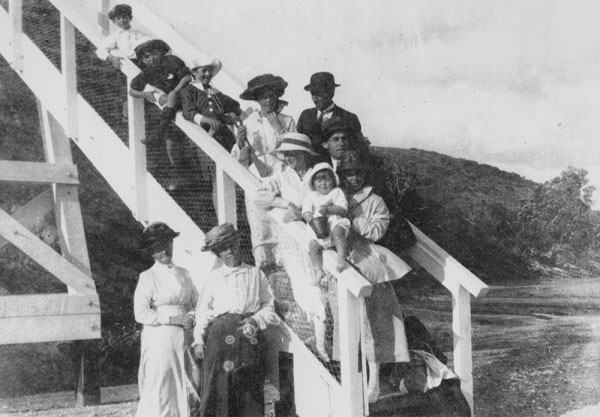 Beachgoers on the Milford over bridge, 1923. Auckland Libraries, Local History Online, EF0021. 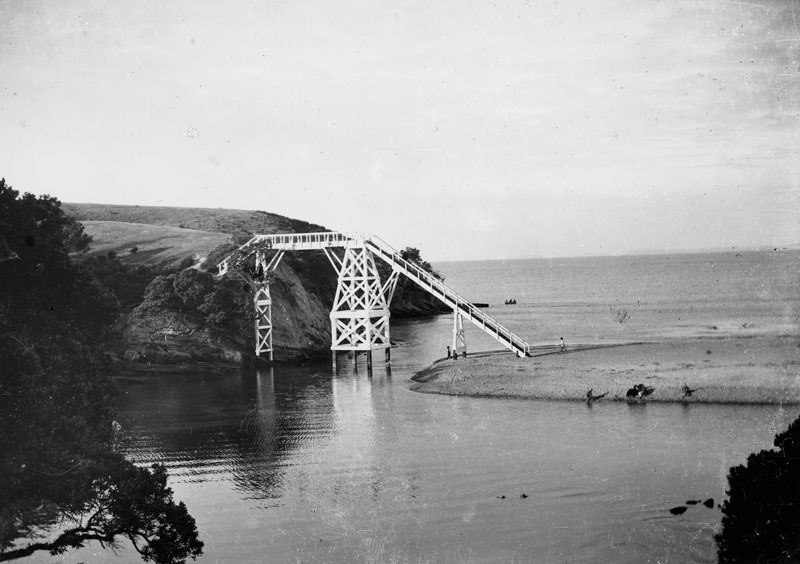 The first foot bridge was initially built as a temporary crossing for the Wairau Creek in 1923. It was known as a ‘lighthouse’ structure, and since the depth of the creek allowed scows and other sailing vessels to sail upstream, as far as Sheriff’s Gum Store at the lower end of Shakespeare Road, it had to be built high enough to allow "the largest yacht to pass under". Ref: Photographer unknown. 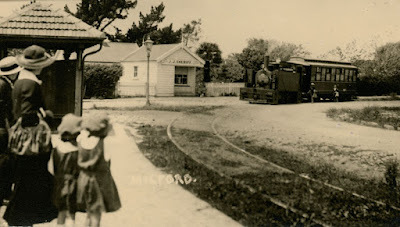 Steam tram at Sheriff's Corner, Milford... 1920s. Ref: Photographer unknown. Footbridge over the mouth of the Wairau estuary, Milford beach, 1920s. Auckland Libraries, Local History Online, T0368. 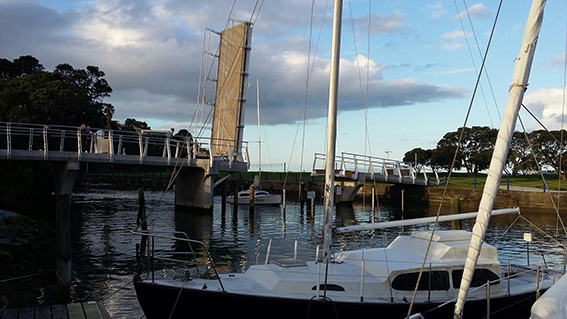 The foot bridge was popular and due to the demands of local residents who wanted a regular means of accessing Milford beach and beyond, a permanent crossing was approved. 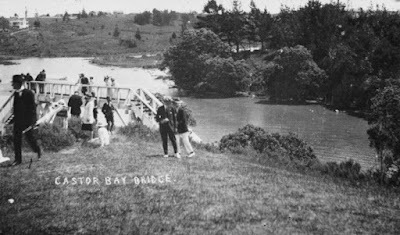 In the 23 January 1923 issue of the Auckland Star it was noted: "…the foot bridge is to become a permanent, not a temporary means of crossing the exasperating little stream". Ref: Castor Bay, Auckland. Morrison, John M, fl 1883-1951 :Photographs of Takapuna and Milford. PAColl-6494-24. Alexander Turnbull Library, Wellington, New Zealand. The bridge was erected at a cost of £270 by the Public Works Department. The Castor Oil Bay Company, Takapuna Borough Council and Waitemata County Council each paid a share of the costs. Modifications were carried out in 1933 owing to the susceptibility of the base steps to the tidal flow of the estuary. The lower steps were extended outward by the addition of a platform mid-way up, an addition that proved popular with swimmers, who used it as an unofficial dive platform. 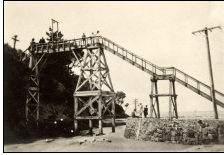 Construction of a stone embankment and wooden breakwater also provided an improved beach and reserve. The stone-built groyne (low wall) at the mouth of the creek was built in the 1960s. Ref: The modified bridge, 1949. Auckland Libraries, Local History Online, T6375. The bridge gradually fell into disrepair and disuse and it was considered so dangerous that it had to be demolished. Early one morning in May 1975, a tow truck was driven onto the beach and hooked up to the supports. Footage of the demolition shows that the truck had barely begun to move before the bridge buckled and came down. Ref: Carolyn Beck. The new Milford Bridge... 2016. Auckland Libraries, Local History Online, NP16-0031. It was not until 2015 that an elegant new bridge was built at a cost of $3.1 million. It was officially opened on 17 December 2015, reuniting the headland walkway with the northern end of the beach after a 40 year hiatus. The central span of the bridge can be raised to allow yachties access to the present-day Milford Marina, and walkers can at last walk directly from the headland to the beach without a long detour. Author: Carolyn Beck, North Auckland Research Centre, Takapuna Library.